Of the 270 million people that have been categorised below the standard, 70 per cent live in rural Indian and 30 per cent in urban India. Hyderabad: Making the country the poorest in South Asia, over 270 million people in India live below international poverty lines. India’s poverty rate is around 21.2 per cent which is worse than its neighbour Pakistan (6.1 per cent), a study by the World Bank has revealed. The second poorest country in South Asia is Bangladesh (18.5 per cent), followed by Nepal (15 per cent). Poverty has been largely calculated on three aspects that is lack of good health, education and living standards and India tops the list for having the largest population that has no access to these essentials. The study found that Indian states like Uttar Pradesh (60 lakh), Bihar (36 lakh), Madhya Pradesh (24 lakh), Odisha (14 lakh), Jharkhand (13 lakh), Rajasthan and Chhattisgarh (10 lakh), lead in the number of poor people with low incomes that fall below the international poverty rate. Of the 270 million people that have been categorised below the standard, 70 per cent live in rural Indian and 30 per cent in urban India. 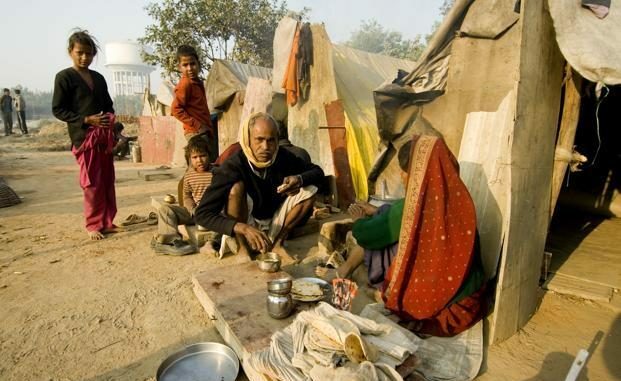 These 270 million people have lower access to basic services like toilets, electricity and tap water. Casual labour is the primary source of income and they spend maximum on their food and fuel and less for education and health. Sri Lanka has the lowest headcount index (1.9 per cent) while Bhutan reported the second lowest (2.2 per cent) in the South Asian region. However, experts in the field said that the study tried to correlate poverty percentage changes over the years against the country’s population.